Throughout the history of naval warfare a consistent pattern has evolved between the development of anti-ship threats and the development of shipboard protective measures against those threats. Since the 1980’s, the combination of ship-board protective measures has been colloquially referred to as ‘survivability’ and is defined more precisely as the measure of a vessel’s ability to complete its mission after an attack. The measure of survivability considers one or more of the following aspects: susceptibility (the ability to avoid being hit), vulnerability (the level of damage when hit) and recoverability (the ability to recover from a given level of damage). Total ship survivability requires a balanced and integrated consideration of the differing facets of ship design including signature control and self-defense weapon systems (susceptibility reduction) and post hit damage mitigation (vulnerability reduction and recoverability enhancement). The significant weight, volume and cost penalties associated with survivability features such as armoring or rapid-response damage control systems may often be outweighed by the simple fact that the probability of the ship getting hit by the threat is minimal. Consequently, an integrated probabilistic approach to the determination and evaluation of a measure of a system’s total survivability is required in order to provide a true measure of mission capability and success. Integrated survivability simulation tools can be utilized to provide probabilistic representations of survivability by combining initial damage effects with recovery analysis into a single software suite that assists in survivability design, design evaluation, requirements assessment, and resource allocation. Thousands of tests are conducted with each test randomly varying extent and location of damage in order to capture the chaotic nature of random unknowns, thus providing a probabilistically determined assessment of occurrences similar to a real world threat event. While historically the enhancement of ship survivability has been primarily associated with naval combatants; as the role of modern naval non-combatants evolves to include additional missions, and as the possibility of asymmetric threats places these ships at increased risk, the assessment of survivability of non-combatant ships becomes necessary to ensure fleet-wide mission capability. The design of “multi-mission ships” and emphasis on fleet-wide standardization has advanced survivability practices on both combatants and non-combatants in the 21st century. Additionally, it is important to recognize that damage can occur outside of a weapon impact. Fire initiation and flooding can be caused by overheated machinery equipment, faulty wiring, equipment cable sparking due to poor maintenance practices, repair activities such as welding or cutting, accidental hazardous material spillage, oil used in cooking, smoking paraphernalia or arson. Accidental flooding can be associated with hull breach due to a collision or grounding incident or deluged pipe rupture from shock. Even with meticulous maintenance practices, situations like these can occur unexpectedly on both combatants and non-combatants alike and are vital to simulate to ensure the vessel is designed to withstand both accidental and intentional damage. As a way to examine the quantifiable benefit of applying survivability practices to non-combatant vessels, Alion’s survivability team performed a case study against a vessel with missions to act as a hospital ship during wartime and provide training and humanitarian support during peacetime. The 6,000 ton vessel was designed with an operating crew compliment of 120 and the ability to accommodate up to 320 total trainees and/or passengers. Primary missions of the vessel included Air Capable Ship (ACS) for medevac, Search and Rescue (SAR) through onboard boats or aircraft, and Medical support through sick bays. Although the ship was not expected to engage directly within a combat zone, it was required to also fulfill common combatant requirements for naval training purposes such as Identify Friend or Foe (IFF) detection, Anti-Surface Ship Warfare (ASU) engagement, and Anti-Air Warfare (AAW) engagement. It is important to note the assumption that the self-defense equipment listed here could be used with dummy detonators for training purposes or loaded with active charges to use in a wartime environment if necessary thus bridging the gap between a traditional combatant and non-combatant. When considering the 3-D model of the case study vessel, structural elements were built using rectilinear mapping to allow for a rapid build time over traditional curvilinear modeling. Rectilinear mapping was still able to maintain simulation accuracy for such a large structure, in this case representing a total displacement within 7% of the as designed value while only requiring a fraction of the modeling time. Compartments were broken down into smaller Axis-Aligned Bounding Boxes (AABBs) to more accurately represent the spread of progressive damage such as fire and flooding throughout the vessel. The model was refined to include over 1,000 AABBs as shown in Figure 1 and over 7,000 structural plate elements, with associated stiffening and thermal insulation, in order to represent almost 600 compartments, with associated environmental conditions, fuel, and tankage loadings prescribed, within 4 Pressure Zones and 4 Fire Zones. Similarly, a total of almost 900 vital components and nearly 3,000 pipes and cables were modeled to provide functional connectivity between over 700 pieces of equipment as shown in Figure 2. In order to properly assess the overall survivability of the case study vessel, the model was subjected to 1,000 impingements across four threats representative of intentional weapon impacts based on the dual nature of the vessel: a Man Portable Rocket, a Naval Artillery Round, and two Anti-Ship Missiles (ASMs) with each threat categorized as “over matching”, “equivalently matching”, or “under matching”. A threat was defined as “under matched” if the vessel was designed to withstand an impact and still maintain full mission capability, as “equivalently matched” if the vessel was designed to withstand an impact and be able to return to port safely under its own power, and as “under matched” if the vessel was designed to withstand an impact and only be able to remain afloat. Additionally, nearly 20,000 collision scenarios of varying speed, displacement, and impact angle and 10 fire scenarios selected based on hazardous materials running through/stored in each compartment and the statistical likelihood of a dynamic event occurring on each space were also assessed for accidental damage. While the survivability analysis of the case study vessel showed several areas for improvement based on a root cause analysis, including deficiencies providing power system recovery when capability is lost post initial automated reconfiguration, unsuppressed fire propagation and the effect on availability of routes for crew and passengers to safely egress to muster stations were among the primary requirement failures identified. This is particularly concerning in scenarios where the total number of passengers exceeds the minimum (120) number of crew members as is possible in inherent Humanitarian and Medical support missions. The root cause of failure analysis discussed previously indicated that the case study vessel was unable to contain fire from progressing outside of the primary damage zone resultant from the naval artillery and ASM missile strikes without Man-in-the-Loop operations (i.e. manual firefighting). The naval combatant interpretation assumed that the Primary Damage Zone (PDZ) encompassed only the compartments directly influenced by the impact of the weapon – the compartment containing the hit location and any compartments open to the blast. However, the recent International Maritime Organization (IMO) Safe Return to Port (SRtP) as dictated by Safety Of Life At Sea (SOLAS) regulations, have defined the PDZ as any compartment within a vertical fire zone containing the weapon affect (i.e. the Main Vertical Zone or MVZ). To account for the IMO SRtP definition, vertical damage zones were superimposed and aligned with the water-tight separation and failure of the performance requirement was updated to “Fire Limited to MVZ”. 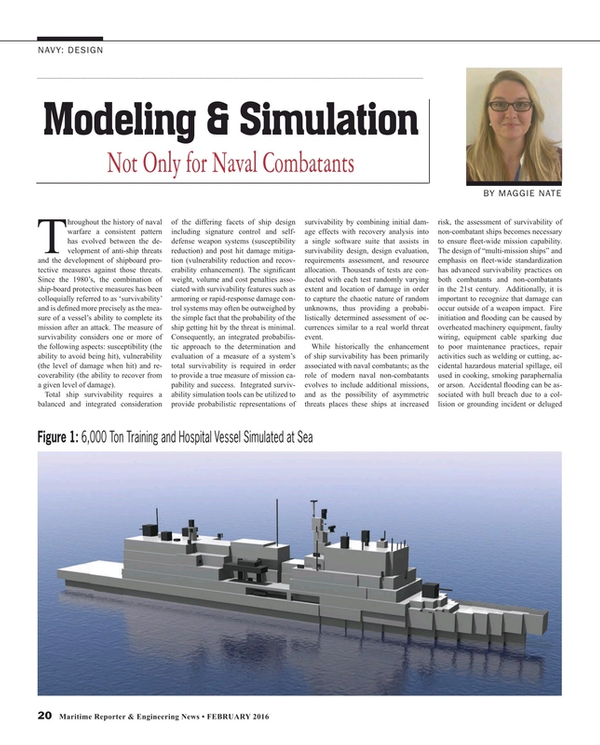 By modifying survivability performance requirement definition from the standard naval PDZ definition to comply with IMO SRtP (coinciding therefore with accepted practice for passenger vessels, hospital ships, and training vessels), the performance of the case study vessel increased by nearly10%. This revised requirement definition for fire spread resulted in approximately 4% of threat weapon impacts breaching the vertical watertight zones thereby violating IMO Safe Return to Port (SRtP) regulations. Approximately 93% of IMO SRtP violations of the Fire Limited to MVZ requirement were due to the unmitigated progression of fire along breached passageways (e.g. fire initiated within a passage which then burns unmitigated across a non-tight boundary) as shown in Figure 3. In this case, a naval artillery impact breaches a command and control space, a pressure lock, and a collective protection system (CPS) fan room door initiating a fire in the starboard Main Deck Passageway. While Man-in-the-Loop Operation (MITLO) actions were not permitted in these analyses, it is important to note that this particular scenario resulted in loss of a “single point of failure” seawater firefighting branch to the deckhouse therefore severely limiting manual and installed damage control capability. Based on this limitation to immediately mitigate fire progression in the deckhouse, the ability for evacuation capability especially since all life boats are located on the deckhouse levels is also restricted. The average breach or flashover time from primary weapon damage compartment is approximately 5 minutes. Therefore, fire containment aboard the case study vessel is functionally dependent on MITLO actions and that limited manning is not recommended for this vessel. As the case study vessel is a multi-mission ship, including hospital, training, and conference hosting capabilities, much of the service life will be spent with significant numbers of untrained personnel on board. This makes express egress an important function of the vessel. Even if all personnel on board can safely egress, emergency evacuation is stalled if either the forward deckhouse or the aft deckhouse (where the lifeboats are located) is inaccessible. According to a National Research Lab study on the ex-USS Shadwell, the decision to abandon ship must be made within 7 minutes of fire ignition or flooding progression in order to ensure that all crew and passengers on board can egress safely because crew in spaces adjacent to a total flashover environment will become disoriented by 7 minutes. The installed casualty management system must have ample sensors and input, as well as a survivable layout, in order to quickly provide the command crew with the information needed to make a timely decision regarding abandon ship. To investigate the egress and evacuation of the case study vessel, the post damage availability of egress routes from each of the \manned spaces as well as the lecture halls (which can pose a “choke point” problem in the event of an emergency evacuation) to any one of the six lifeboat muster stations was examined. Within this analysis, the condition of evacuation (e.g. do all passengers egress safely?) was not initially examined, however, the possibility of evacuation (i.e. does an unmitigated route to any lifeboat muster station exist?) was examined. Following the conclusion of the egress route availability assessment, a crew egress safety study to determine the condition of the evacuation (e.g. can all passengers egress safely given a damaged state?) was considered. For the crew egress safety study, the vessel was subjected to several weapon impact analyses affecting primary function and damage control performance requirement categories that would be vital to safe evacuation including Damage Stability, Fire Protection, Power, Propulsion, and Navigation. Within the crew egress simulation based on the fire spread described above, crew and passengers were modelled in all accessible compartments as appropriate. In order to account for factors that would affect crew speed during evacuation such as; injury, littering, lighting effects, queuing effects, etc. an average crew speed of 0.40 m/s was assumed based on corrective factors as defined by the IMO. Additionally, a set time of 300 seconds (5 minutes) post weapon event was assumed as the time at which evacuation initiates also based on IMO guidelines. The average time to evacuate from any manned compartment to a pre-designated muster location was approximately 100 seconds, with the maximum time approaching 4 minutes (240 seconds). Based on the route check assessment and confirmed by crew evacuation study, the evacuation of the case study vessel post weapon impact initiated no later than 7 minutes post impact in order to reduce the probability of loss of life. While the case study examined above was aimed to expand the application of survivability to vessels with naval non-combatant missions, the next step in this series is to examine the applicability of standards developed for mid-size naval surface vessels to other case studies such as small patrol craft, offshore oil platforms, passenger vessels, and/or modernizations from flight to flight. For example, is it worthwhile to replace a helideck with an infinity pool or replace UAVs (unmanned aerial vehicles) with semi-submersibles and repeat survivability simulations when operating in the same waters? With resources already available at our fingertips and the ability for thousands of analyses ready at the touch of a button, the answer, in this engineer’s opinion, is definitely ‘Yes’. Originally presented at WMTC 2015, Providence RI, November 2015. Edited and reproduced with the permission of the Society of Naval Architects and Marine Engineers (SNAME). Maggie Nate is a Virginia Tech graduate and former Aerospace Engineer turned Naval Architect. She has spent the past three years working at Alion Science and Technology performing survivability analyses on more than 10 domestic and international projects. Maggie is also the chairman and founder of SNAME’s Technical and Research Panel SD-11:Post-Incident Safety Assurance and the Associate Editor for Survivability of ASNE’s Naval Engineers Journal.